Ain’t It Cool News interviews Francis Manapul about the Flash. What have been some of the challenges having to draw a character who is basically constantly in motion? FM: I think the challenge comes in thinking of new ways to portray his speed. I’ve been incorporating a lot of his environment to show motion aside from the Flash himself. From Barry catching Chinese food thrown in the air to putting money in the meter as he evades the villains. Geoff has also been upping his game by having Barry do different things with his speed from dissecting a car apart in mid air to learning and building an apartment in less than minute. He talks about working with Geoff Johns, adapting his art style to the Flash, working for DC Comics, and more in the full interview. The artist has also posted several pages of art from today’s Flash #3. This entry was posted in Creators and tagged Francis Manapul on June 30, 2010 by Kelson. Part Three of “The Dastardly Deaths of the Rogues” arrives in stores tomorrow. It may be BRIGHTEST DAY, but when a mysterious group of so-called heroes turns up, another Rogue ends up dead. 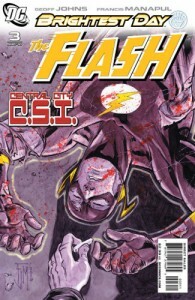 Plus, the mystery deepens as The Flash witnesses another murder — his own! Written by GEOFF JOHNS · Art and cover by FRANCIS MANAPUL · 1:10 variant cover by GREG HORN. DC has a 5-page preview online. Justice League of America #46 – Start of a JLA/JSA crossover, featuring both Jay Garrick and Jesse Quick…plus a variant cover focusing on Jesse Quick by The Flash artist Francis Manapul. Justice Society of America #40 featuring Jay Garrick and Liberty Belle. 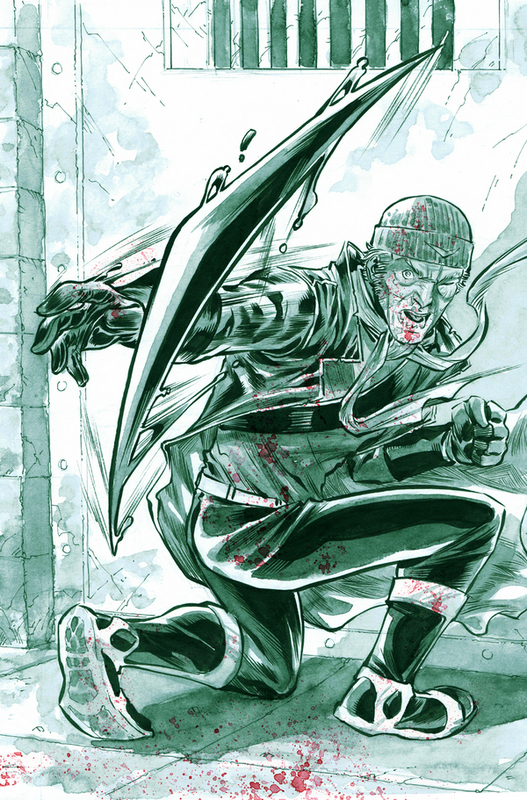 Velocity #1 – DC isn’t the only publisher with speedster heroes. Velocity from Top Cow’s Cyberforce gets her own solo miniseries. Newsarama has a preview, and I’ve written a review of the issue. This entry was posted in Out This Week on June 29, 2010 by Kelson. It’s a single board of paper with drawings of the Flash from some of his most notable artists. You’ve got the two main Flash artists from the ’90s: Greg LaRocque (my favorite Flash artist) drew the large picture of Wally on the left, and Mike Wieringo drew one, too! There are also drawings by Pop Mhan and Craig Rousseau. To top it off, Carmine Infantino did the sketch at the top. 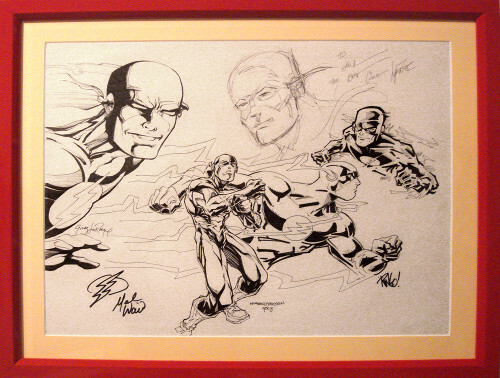 (I like to think that the 4 drawings are of Wally, with the spirit of Barry looking over, since it’s in a lighter ink.) Oh, and Mark Waid signed the bottom as well. I don’t own a lot of comic art, but even though this was expensive, I jumped at the chance to get it. It really makes me wonder what the story is behind the fan who originally went around collecting these sketches. Update: Check out the comments below, where artist Greg LaRocque reveals the secret origin of the sketch! This entry was posted in General and tagged Art, Barry Allen, Carmine Infantino, Craig Rousseau, Greg LaRocque, Mark Waid, Mike Wieringo, Pop Mhan, Wally West on June 29, 2010 by Kelson. Philip Tan posts an image of Flash and Batman, saying, “What’s This? What’s THIS?! All will be made known soon… Very soon…” (via @SpeedsterSite). That F’ing Monkey shows off a custom Captain Cold Munny figure. Comics Cosplay Brasil: So that’s where the Flash gets his energy! The Nerdy Bird shows us some super-hero watercolors. This entry was posted in Fandom, Round-Ups and tagged Art, Batman, Captain Cold, Cosplay, Crisis on Two Earths, Fan Art, Linkblogging, Philip Tan, Phillip Bourassa on June 27, 2010 by Kelson.